This post and recipe for Peppermint Mocha Energy Bites is sponsored by State Farm®. 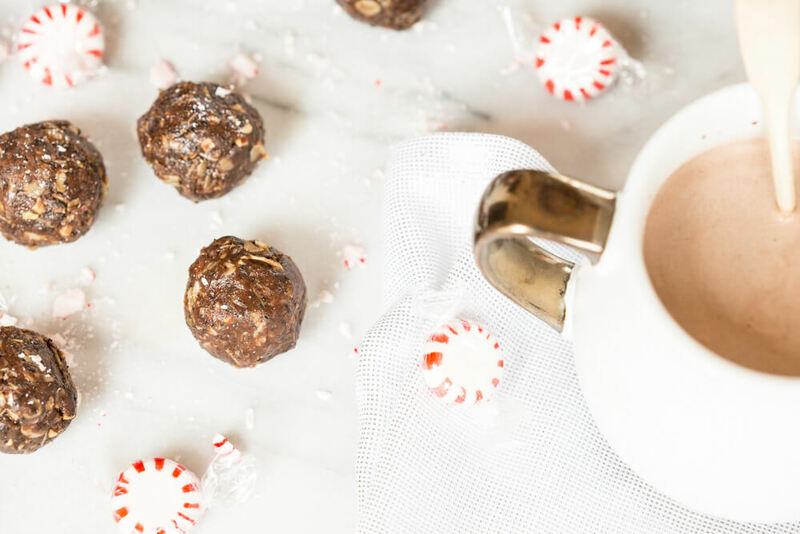 The holidays are a busy time for travel, especially road travel, so I’ve created these Peppermint Mocha Energy Bites to keep you energized and fueled while you’re on your way to your winter destination. We all need a little (or a lot) of coffee on the drive, especially if there are kids in the backseat asking, “Are we there yet?” Luckily our little guy isn’t talking yet so we have (mostly) quiet drives since the car seat is his snooze button. I was talking with the hubs about what he likes to snack on while we are traveling, and trail mix, fruit and coffee were at the top of his list. I can totally relate (you’re nodding your head about the coffee if you know me). I like to have non-refrigerated snacks at the ready so we don’t have to make as many pit stops. 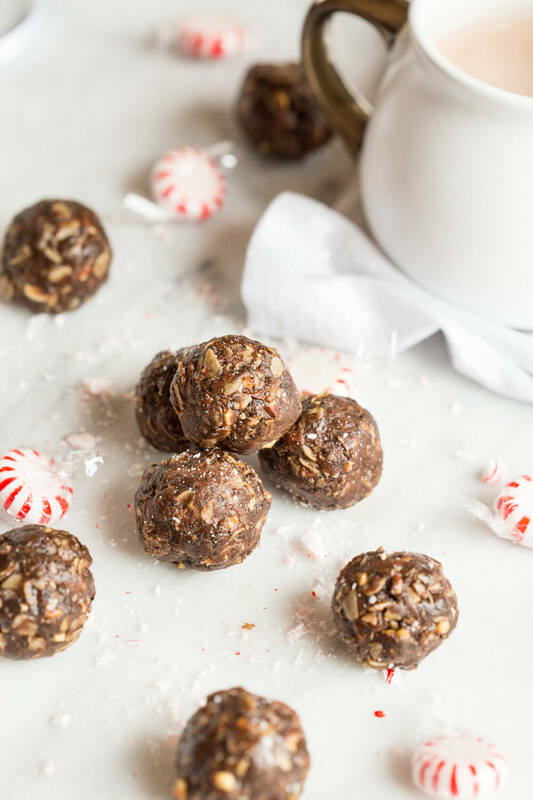 So, MORE Peppermint Mocha Energy Bites, please! Because the winter months are a busy time for traveling and unexpected things come up, State Farm is committed to keeping drivers safe on the road. They’ve teamed up with state transportation agencies in 15 states to promote highway safety through the Assist Patrol program. This program provides roadside assistance on major highways all the time (even during the holidays) which made my travel a little easier, knowing they’re available to help. This roadside assistance is completely complimentary and includes services like a tire change, fixing motor mechanical problems, and removing debris from public highways. Pretty cool right? So pack your bags and get the Peppermint Mocha Energy Bites ready before you hit the road! This recipe is super easy to prepare… all you will need is a big bowl and mixing spoon. I’m all about easy this time of year!! 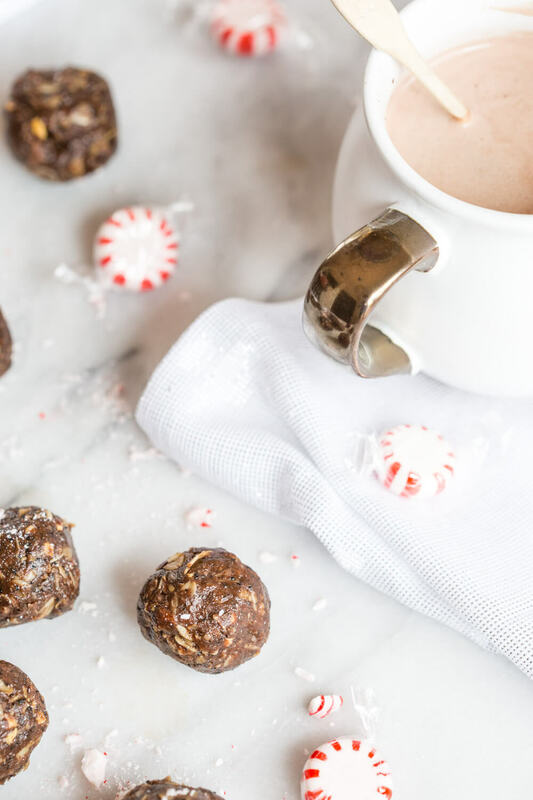 I hope you and your family enjoy these Peppermint Mocha Energy Bites and have a safe and joyful New Year. To learn more about State Farm Assist Patrol visit AssistPatrol.com and be sure to follow State Farm on Facebook and Twitter. 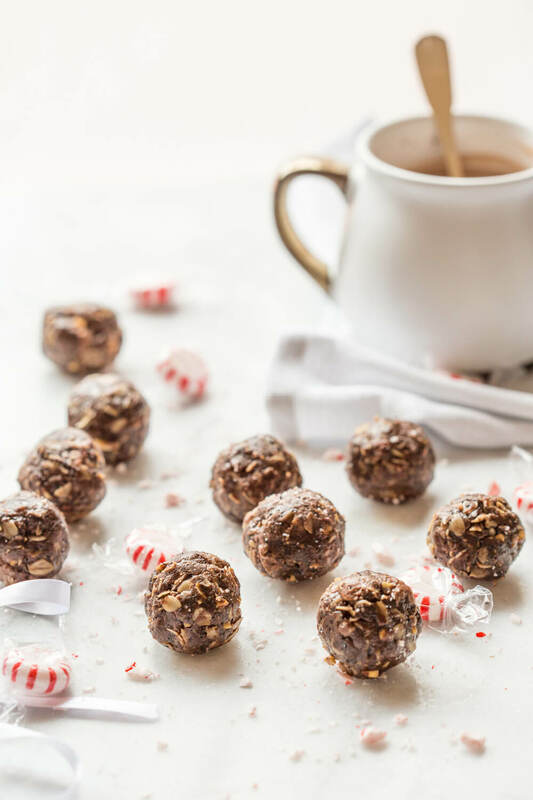 These Peppermint Mocha Energy Bites made with almond butter, oats, and ground coffee are sooo easy to prepare– all you need is a big bowl and mixing spoon. They make the perfect snack for traveling during the holidays! In a large bowl, mix together almond butter and honey. Place in microwave for about 20 seconds to warm and melt a little. Stir in cocoa powder, coffee, peppermint extract and salt until blended. Add oats and chocolate chips and mix until incorporated. Roll out dough into 16 uniform balls and place on parchment paper. Store in airtight container until ready to eat. This post and recipe for Peppermint Mocha Energy Bites is sponsored by State Farm. 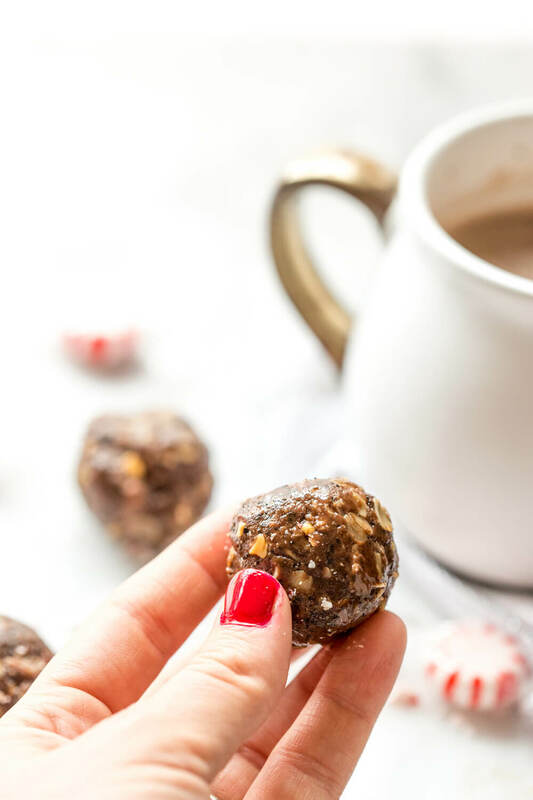 The perfect energy bites for the holiday season! Sounds delish! THX!! Can’t get enough peppermint these days. 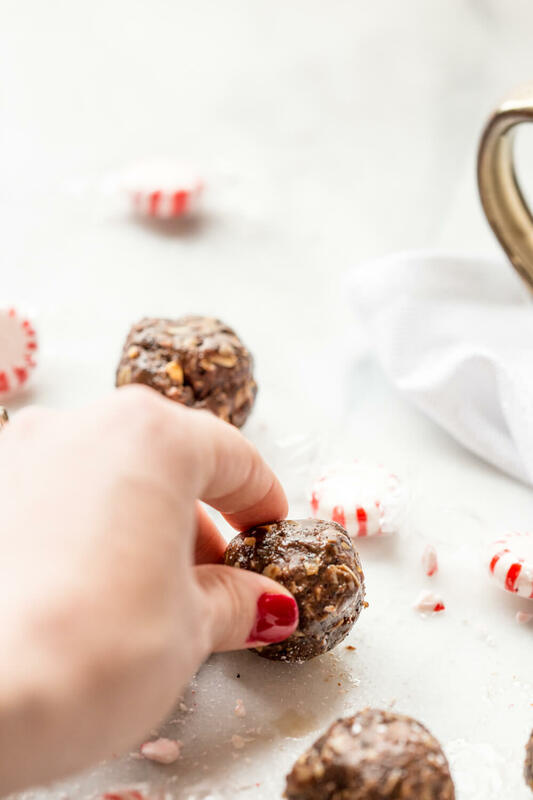 I’m forwarding this recipe to my daughter who is absolutely GA-GA for chocolate and peppermint! These energy bites would be great for any day out and about when you need a pick-me-up and don’t want to stop! And I like the peppermint flavor you added. Yum. What great wintry flavors for a healthy energy boost! So convenient! I love healthy chocolate recipes, they make sticking to a diet much easier! Amen! Gotta have my chocolate.